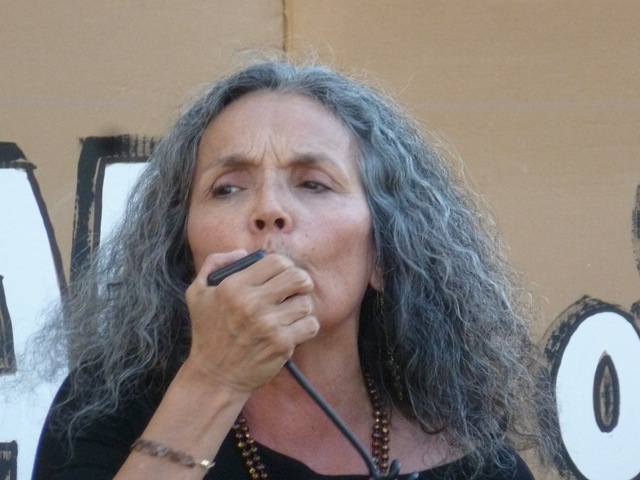 TUCSON—The 30th birthday of the Corrections Corporation of America, which the company will celebrate in Nashville on May 16, has been turned into an opportunity for protest by critics of for-profit incarceration around the country. 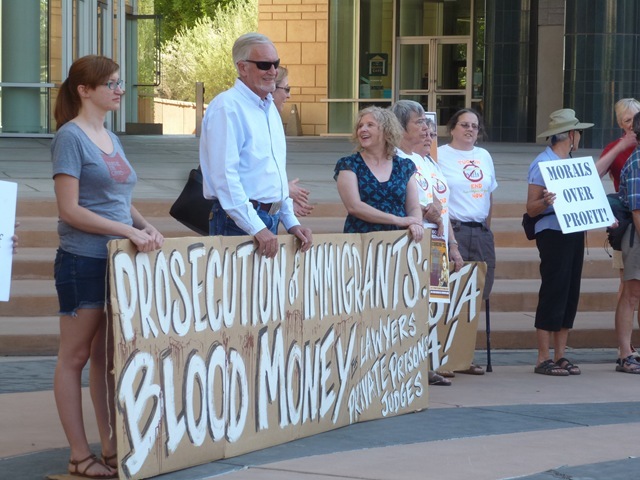 Tucson, Arizona, was the site of one protest today. 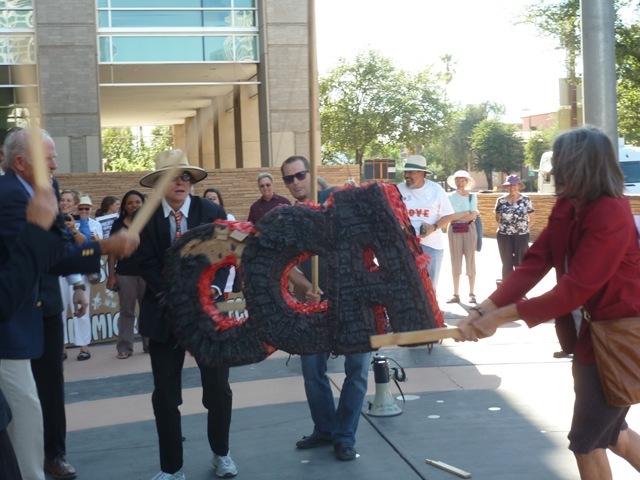 Sixty-five people, including local faith leaders, immigrants’ rights activists, and prison reformers, met outside the DeConcini Federal Building for speeches, chants, and a skit involving a CCA piñata. 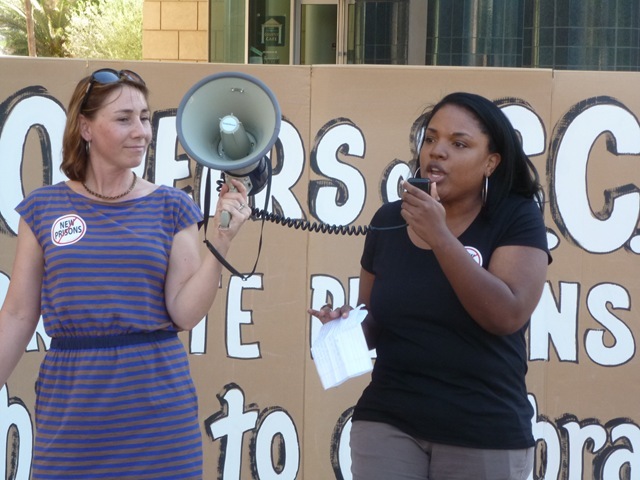 CCA operates 6 prisons just in Arizona. And the results aren’t pretty. 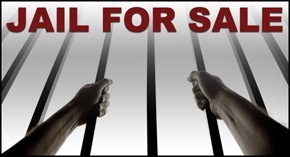 Isaacs’ research shows private prisons run by CCA and other companies are more dangerous and more expensive. But some state’s have gotten the message that they will not incarcer ate their way to public safety, according to Nicole Porter of The Sentencing Project. “Times are changing,” she said, noting that not a single state picked up on CCA’s offer to 48 governors to buy their prisons and operate them on contracts guaranteeing high occupancy rates. 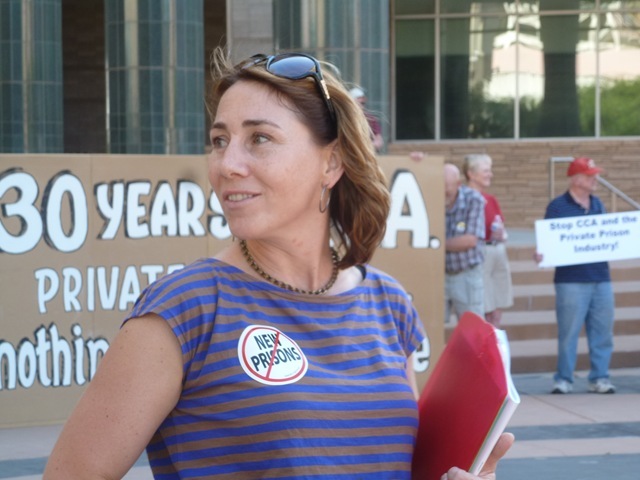 Kymberlie Quong Charles of Grassroots Leadership, a Texas-based group, lifted up New Hampshire as an example of a state that has said “NO” to a privatization proposal and came close to banning the practice as a matter of law. Even Texas is on its way to closing CCA facilities, she said. Garcia said recent suicides of immigrants being held at CCA facili ties in Eloy, Arizona, illustrate the country’s mixed up priorities. While people are losing jobs, losing homes, and even losing their local post offices, it’s time to link up the issues and demand change. High on her list: put CCA out of business. 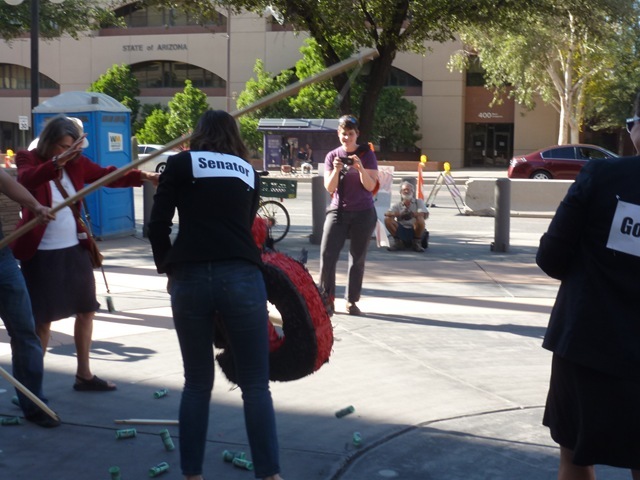 While people chanted “CCA Go Away,” black jacketed protesters labeled “Senator” and “Banker” went after the CCA piñata and scooped up the play money that spilled on the sidewalk. That cash-strapped states and the federal government could actually save money and improve public safety by de-incarceration is a point that may be gaining favor. That’s not in the interest of CCA and other companies whose bottom line depends on full prisons and more of them. This struggle is going to go on for awhile. 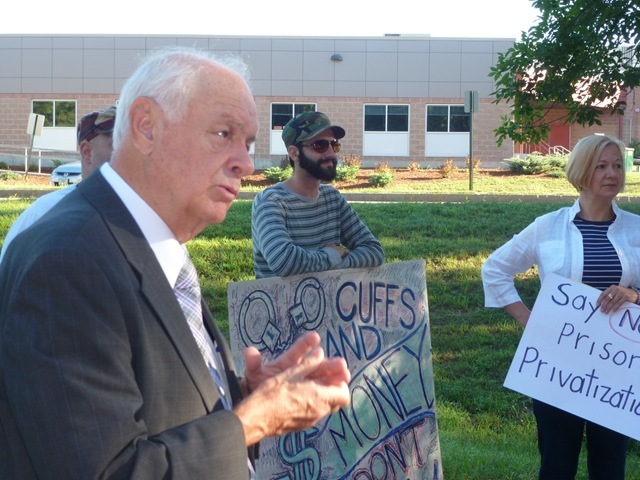 New Hampshire Labor News asked me for an update on the private prison issue. Check them out at http://nhlabornews.com/. 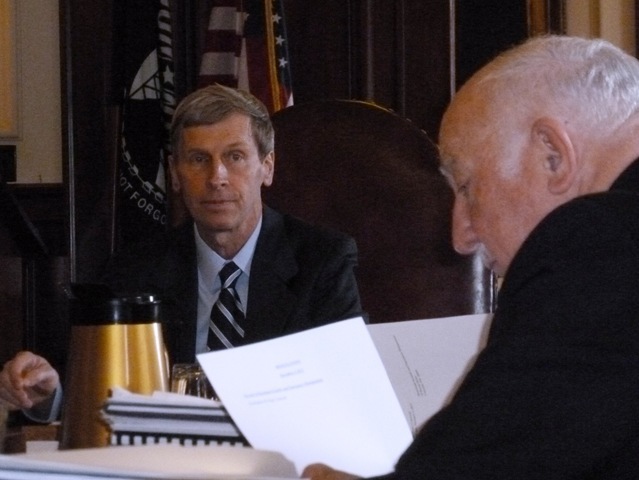 With Governor John Lynch leaving office and a significant turnover in the membership of New Hampshire’s Executive Council, the danger that the state would turn over management of its prisons to a private firm has diminished. However, privatization foes remain vigilant until the proposal is not just really dead but really most sincerely dead. 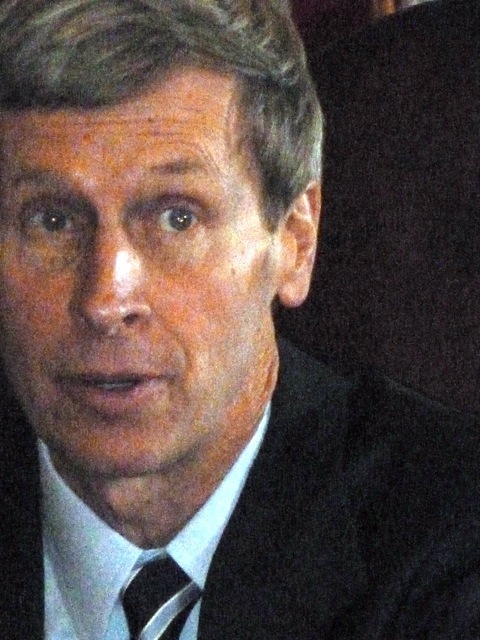 The possibility of privatization was raised in a Request for Proposals (RFP) issued by the state a year ago. The RFP explicitly invited private firms to offer plans to build and operate a prison for women, a prison for men, or a “hybrid” facility for both men and women. Private firms were also invited to submit plans to build such facilities and lease them to the state, or renovate existing facilities for the same purpose. Four firms responded to the detailed RFP, reportedly with enough paper to fill a room in the State House Annex. None of the bids proposed to build or renovate a facility just for women, despite the fact that the existing women’s prison in Goffstown is badly over-crowded and inadequately designed. Corrections Corporation of America, the industry leader, revealed it would consider sites in Lancaster, Northumberland, and Hinsdale. Management and Training Corporation cast its sights on land on Hackett Hill Road in Manchester. 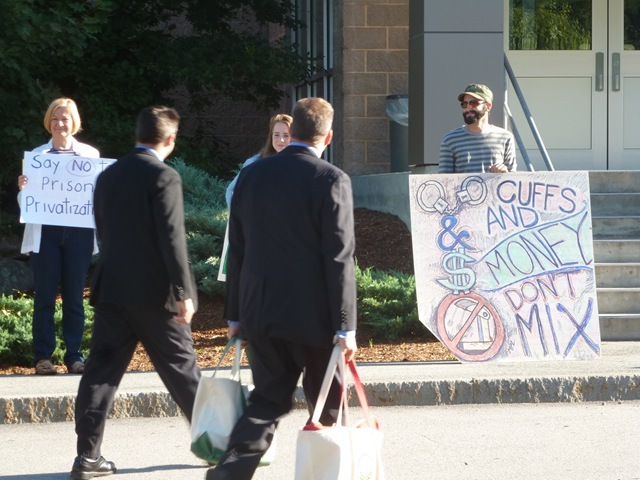 The Hunt Group (now known as CGL) proposed to build on land already controlled by the state prison in Concord. The fourth, the GEO Group, did not reveal the location of its proposed facilities. CCA, GEO, and MTC also contracted with local lobbyists to help them make their cases. Due to the complexity of the request and the responses, the Departments of Administrative Services and Corrections determined they were not able to evaluate and compare the proposals by themselves. With a vote from the Executive Council, the State signed a $171,000 contract with MGT of America to help analyze the documents. MGT’s report was due October 5 and their contract was to expire October 31. Those dates have come and gone with no report yet. “It’s unlikely it’s going to be resolved this year,” Gov. Lynch said at the October 17 Executive Council breakfast. While we wait for the consultants (who happen to have deep ties to the private prison industry) to complete their report, Gov. Lynch has not stopped talking up the possibility that the state would contract with a private firm to finance and build a prison, which it would then lease to the state. Lynch appears to be convinced that the men’s prison needs to be replaced and that the Legislature would never approve funding through the capital budget process. From his perspective, contracting out prison ownership is a way to get around the normal budgeting process. That there has been no public discussion of the need for a new men’s prison does not seem to factor into his position. Moreover, such a propo sal would give a private firm a foot in the door to promise cost savings down the line if they were given full control. The experience from other states shows clearly that privatization is not a path to cost savings. Despite anti-union policies and reduced expenses of wages, benefits, and training, private firms in other states have been unable to save money for the states. What they have accomplished is a pattern of increased violence within the walls leading to a less safe, less secure environment for prisoners and staff alike. This in turn has led to high levels of staff turnover, feeding less security. And it means prisoners — most of whom will return to the free world — will be less likely to get the support they need to live productive lives outside the prison walls. Incoming Governor Maggie Hassan has been explicit that she has no interest in turning over the prison keys to private firms. Whether she agrees with her predecessor that the men’s prison needs to be replaced is not yet clear. What is clear is that the state does need to do something about the women’s prison, which is already the subject of a civil rights lawsuit the state is likely to lose. What is also clear is that approaches to crime and corrections that emphasize alternatives to incarceration, provide counseling and education to those who need it, and that interrupt the school-to-prison pipeline can be more effective and save money for taxpayers. The most active anti-privatization groups — including the State Employees Association, the NH League of Women Voters, Citizens for Criminal Justice Reform, the NH Association of Criminal Defense Lawyers, the NH Civil Liberties Union, and the American Friends Service Committee — are optimistic they can claim victory soon. They are already turning attention to development of a more humane approach to corrections, one that would preserve good jobs and save the state money. 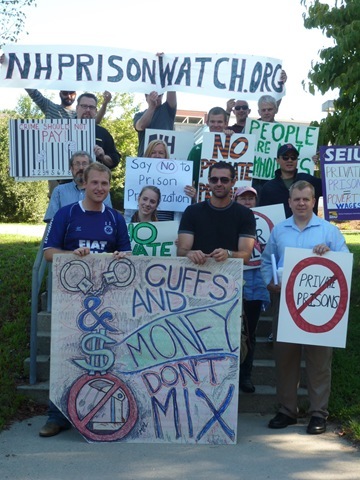 For more information, visit www.nhprisonwatch.org.